Please note that the ‘Contemporary Topiary’ Continuous Professional Development day planned for 29th February/1st March at Missenden Abbey has been postponed until later in the year. Details of the new arrangements will be sent to those who have expressed an interest in attending and will also be available here on the website. A small group of EBTS members have been working on the creation of an exciting educational module for British Horticultural Colleges on the art and craft of Contemporary Topiary, which defines topiary as “the art and craft of clipping and shaping shrubs and trees, either individually or in groups, for both aesthetic and practical purposes”. This will include everything from abstract green sculptures, to rolling cloud hedges, pleaching, espalier work, ornamental cloud trees, as well as conventional geometric topiaries, and seeks to place topiary as a major craft tool for shaping and designing space in gardens, for professional garden students in the 21st century. There has been a drop-off in number of students going into horticultural courses, as aesthetics have been little emphasised, and gardening has increasingly been perceived by potential students and career planners as low calibre without much creativity. A recent report raises concern that by 2020 there will be a shortage of trained gardeners. We want to help raise the bar in every way, ensuring that gardeners have both a measure of creative horticulture and aesthetic training, as well as the deep plant training, craft skills and understanding, to meet any gardening challenges. 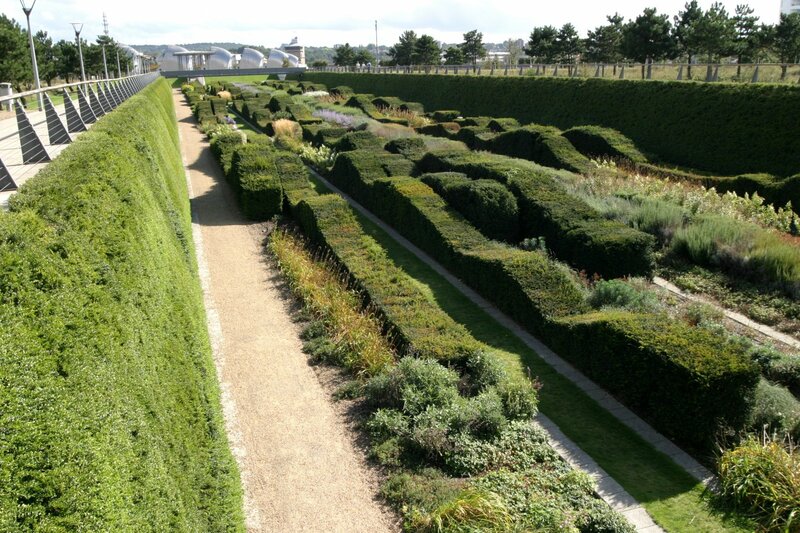 The course will encompass everything from the most contemporary garden styles, of clipped, organically free-flowing hedges used by international designers like Jacques Wirz, Fernando Caruncho and Piet Oudolf, to fusion styles using Japanese techniques, to traditional formal topiary. The course will look at everything from great heritage gardens, municipal parks, small suburban gardens, the creation of civic landscaping on traffic islands to container planting for terrace and front door or office block piazzas. Hopefully if successful, the very fresh approach of this module will be taken up in continental Europe as well. The Society has a great depth of expertise, with many published authors in the fields of horticulture, garden history and design. It has set itself the task of collating heritage information from around the world on training shrubs and trees, as well ensuring that this will lead to a myriad exciting new green spaces. A gardener gardens with his eyes, as does a farmer. The eye needs to notice everything. A gardener works with their hands, gently working with plants and soil – a great sympathetic craft tradition keeping plants healthy and strong, and where necessary skilfully containing their growth in sympathy with the community of plants around them. Primarily, as with all who work with living things, the gardener uses the heart in all activities in a sympathetic state of creative communion with all that part of changing nature in their charge. Good gardening is done with feeling.